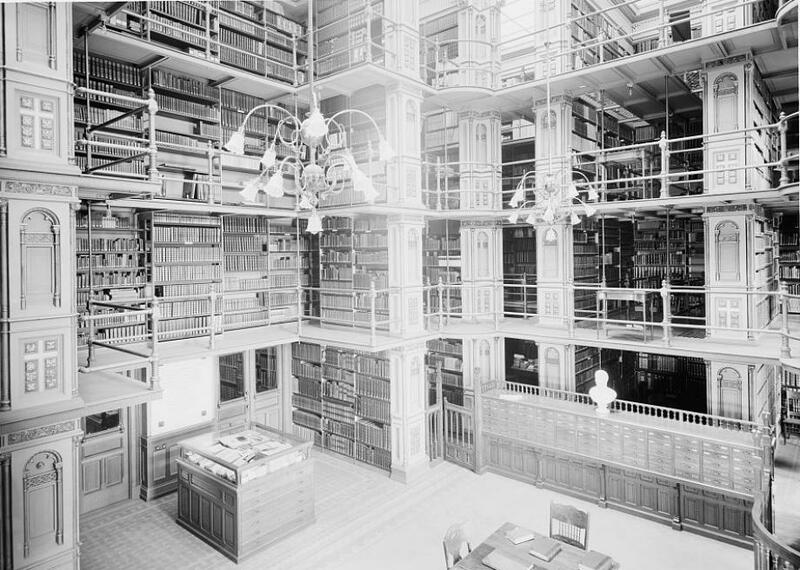 This Georgetown library was one of America's great old book shrines. Riggs Library Is a Shrine to Books Overlooking Washington, D.C. The view from the second floor walkway. Riggs Library at Georgetown University is one of the United States’ great old book shrines. Dating to 1898, Riggs has four floors of cast iron walkways laid out around a central light court. Sixteen columns divide the hall into smaller alcoves, and two spiral staircases connect walkways. Riggs was designed by an architect named Paul J. Pelz, who had just finished drawing up blueprints of the Library of Congress. It’s located on the top floor of Healy Hall and has sweeping views down the Potomac River. Construction of Georgetown’s library was financed by Elisha Francis Riggs, to commemorate his father George and his brother Thomas and the centennial of the university. Thomas was the force behind the Riggs family fortune. He made a fortune in banking (he ran the so-called “Bank of Presidents”) before turning to philanthropy. Back in the day, Riggs Library boasted an impressive collection of storied old books. Contemporary writers marveled at the numerous first editions, 18th-century prayer books, Chinese dictionaries, and Renaissance-era Italian texts. This treasure trove was protected by “fire-proof” building materials: masonry walls, cast iron shelves, and terracotta tile floors. Riggs was a functional library until the 1970s, when a larger library facility opened on campus. Today it is used mainly as an event space.